Pham, second from right, Boden, center, and Leuthi, second from left, after a performance with fellow musicians at Guangzhou University. Three Washington State University music faculty traveled to China in December as part of a new West Meets East scholarly exchange program aimed at bringing Asian musicians to WSU and bringing WSU musicians to Asia. 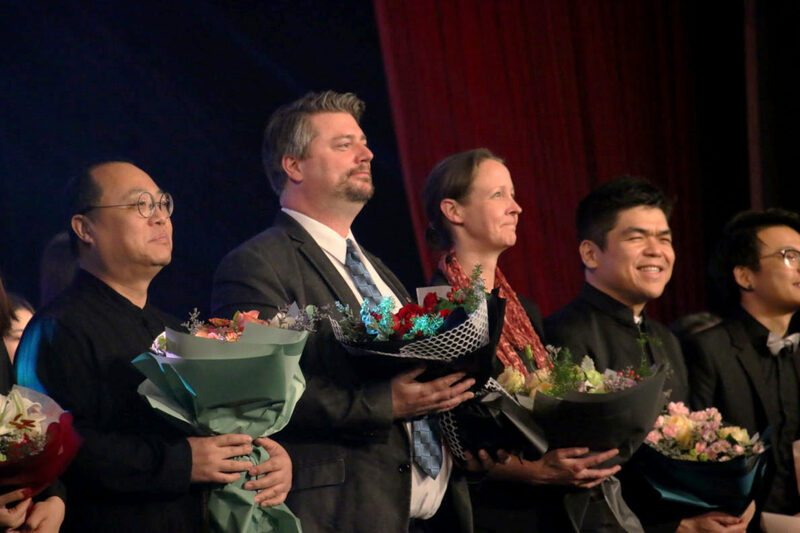 Danh Pham, director of WSU Bands and Orchestras, Ruth Boden, cellist and associate professor of music, and Dean Luethi, choral conductor and director of the School of Music, performed at Guangzhou University in Guangzhou, China, and worked with a number of Guangzhou‑area bands, orchestras and choirs composed of students from middle school through college levels. Their trip was made possible by a grant Pham received from the WSU Center for Arts and Humanities for his project which takes WSU performers and pedagogues to Asia and vice versa. The three faculty members were hosted in China by Zhongyun Luo, resident conductor of the Guangzhou University bands and orchestra. The opportunity to engage with Chinese musicians of all ages—and with a musician of Law’s prominence and scholarship—was invaluable, Pham said. Last month, Law came to WSU and for two weeks served as guest conductor-in-residence with both the WSU Symphonic Wind Ensemble and Symphony Orchestra. This was a part of Pham’s West Meets East project. While at WSU he also auditioned for a Teaching Assistant position to earn his Master of Arts in Music at WSU. The WSU trio’s experience in China culminated in a performance at Guangzhou University with Pham conducting their bands and orchestra. Boden played a cello concerto with the orchestra as part of their New Year’s concert, and Luethi conducted the choir and orchestra in a combined piece. During the final performance, Boden played a fantasy of Chinese folk songs with accompaniment by the Guangzhou University Symphony Orchestra.